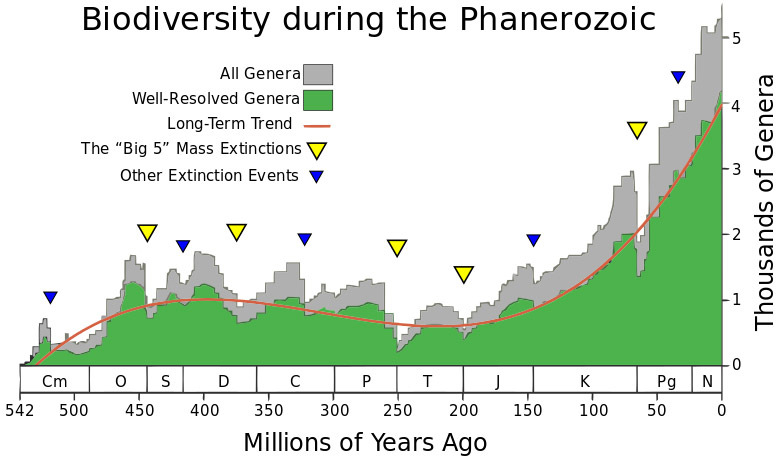 There are said to have been 5 great mass extinctions in the last 540 million years (the Phanerozoic) and a new paper claims – without carrying much conviction – that it was really six (with two being very close together). The Alarmists claim that humans are causing a new great mass extinction (the 6th or the 7th) and that this threatens a catastrophic collapse of biodiversity. This contradicts the fact that there are more species alive today than ever before. Moreover, why this high level of biodiversity is necessary or a “good thing” remains a mystery. The mass extinctions of the past are generally put down to various external events which provided a sharp shock to the environment in which highly stressed species existed. Nearby supernovas, asteroid impacts, sudden tectonic plate shifts, glaciation, and super-dooper-volcanic eruptions are among the “shocks” suggested. But I would argue instead that mass extinctions are necessary and unavoidable. They are necessitated by the ineffectiveness of the process of evolution itself. They provide the self-correction necessary to cope with the mass of “rubbish” species created by the hit-and-miss process of evolution. The external shock is only incidental and acts as the trigger for the extinction of the highly-stressed “rubbish” species. None of the historical mass extinctions ever posed any threat to the continuation of life. Instead they have served to muck out the dung from the evolutionary stables. Wikipedia: Although there are 10–14 million species of life currently on the Earth, more than 99 percent of all species that ever lived on the planet are estimated to be extinct. Evolution fails in over 99% of its attempts to create species that can survive. The 1% of species that do and have survived may seem to be perfectly tailored for the prevailing conditions but that is putting the cart before the horse. Evolution has no direction and does not seek excellence. It only throws up a plethora of species where just 1% of those species happen to suit the prevailing conditions. One round peg out of a 100 different shapes may happen to fit a round hole but the round peg itself was not designed to fit – it happened to be the only one of many which did. For every species which is just good enough to survive, evolution gives another 99 which are not. As a process it is a remarkably ineffective one. Humans are not the result of “intelligent design”. They are just the 1% of all the species created by evolution which happened to fit the round hole of the prevailing environment. The range of dates in that statement reflects profound uncertainty about the current rate of extinction. Estimates vary a hundred-fold – from 0.01 per cent to 1 per cent of species being lost per decade. The phrase ‘all currently threatened species’ comes from the indispensable IUCN (International Union for Conservation of Nature), which maintains the Red List of endangered species. Its most recent report shows that of the 1.5 million identified species, and 76,199 studied by IUCN scientists, some 23,214 are deemed threatened with extinction. So, if all of those went extinct in the next few centuries, and the rate of extinction that killed them kept right on for hundreds or thousands of years more, then we might be at the beginning of a human-caused Sixth Mass Extinction. Worrying about whether the 6th mass extinction has started or not is moot. A 6th mass extinction is needed. A failure rate of 99% creates a terrible lot of dross. Over time, all the “rubbish” species produced by evolution accumulate and clutter the available environment. They restrict the space available for more suitable (worthy) species. The analogy with my desk fits perfectly. Only one of every hundred pieces of paper needs to be kept. Every once in a while – usually triggered by the shock of having to make my tax declaration – I clear out the rubbish. Mass extinctions are then due to the accumulation of too many “rubbish” species which are highly stressed – because they are not quite good enough to survive – and then which end up being susceptible to any external shock which tips them over into the dustbin of extinction – where they belong. It is mass extinctions which provides room for the “good enough” species to grow and even thrive. Mass extinctions provide the clean-up mechanism for a very sloppy and inefficient evolution process. A rather drastic clean-up method perhaps but no more drastic than diverting the Alpheus and Peneus rivers to muck out the Augean stables! If it is in fact true that we have more species alive today than ever before then the number of “rubbish” species around is also probably at an all-time high. A new, 6th, mass extinction is probably necessary to clean up the mess. It is clearly overdue. And that is really the problem with the alarmist conservationists who are wasting resources in trying to protect some of the “rubbish” species which are merely examples of the failures of evolution and which deserve to be consigned to the dustbin of extinction. Species which do not adapt to the dominating presence of humans are among the “rubbish”. It may be regrettable that tigers and elephants are on the “rubbish” list but the reality is that they are failed species unable to cope with their environments and which are now restricting the dominant species. It only emphasises that true conservation would not try to freeze these species into failed patterns but to genetically adapt them to be neo-tigers or neo-elephants which would no longer just be “rubbish”. This entry was posted on April 23, 2015 at 7:59 am and is filed under Alarmism, Biodiversity, Evolution. You can follow any responses to this entry through the RSS 2.0 feed. Both comments and pings are currently closed.